Pieter Buys, chairperson of the South African Mango Growers’ Association, notes that just on the Johannesburg Fresh Produce Market on some days there were 70,000 more cartons of mangoes than on the very best days in other years. All of the Tommy Atkins mangoes on a tree don’t ripen simultaneously, he explains, therefore trees need to be selectively harvested, twice or three times a week, which pushes up labour costs. Sometimes producers decide – to cope with a harvest as large as this, or to get on the market before Christmas – to pick the trees clean, which can result in green fruit on the market which are sold at a price that drags down the general price. Partly in response to the large harvest, a number of South African mango growers have decided at the beginning of the year to increase exports of Tommy Atkins to Europe (not usually a preferred export cultivar), with the strike in Peru delaying the arrival of their volumes. Much of it is still underway to the market. The Kent and Keitt export season will now start; last year South Africa exported 6% of its total mango crop. 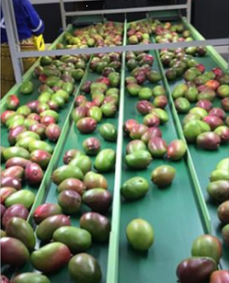 Mango producers are relieved that the Tommy Atkins harvest is now making way for Kent and Keitt mangoes (much of it for processing with an attractive export market for dried mango), Shelly, Rosa, Joa and Heidi mangoes for the fresh market. Prices for these cultivars show an improvement on prices earlier in the season. However, it’s been a particularly difficult January, a month in which consumers traditionally have little left over after the holidays. Pieter says that the effect of a consumer slowdown is felt not only by mango producers, but by vegetable and meat producers too.